The Third Battle of Kharkov was fought between Feb. 19 and March 15, 1943, during World War II. As the Battle of Stalingrad was concluding in early February 1943, Soviet forces launched Operation Star. Conducted by Colonel General Filipp Golikov's Voronezh Front, the goals of the operation were the capture of Kursk and Kharkov. Spearheaded by four tank corps under Lieutenant-General Markian Popov, the Soviet offensive initially met with success and drove back German forces. On Feb. 16, Soviet troops liberated Kharkov. Angered by the loss of the city, Adolf Hitler flew to the front to assess the situation and meet with the commander of Army Group South, Field Marshal Erich von Manstein. Though he desired an immediate counterattack to re-take Kharkov, Hitler ceded control to von Manstein when Soviet troops neared Army Group South's headquarters. Unwilling to launch a direct assault against the Soviets, the German commander planned a counterstroke against the Soviet flank once they became overextended. For the coming battle, he intended to isolate and destroy the Soviet spearheads before mounting a campaign to re-take Kharkov. This done, Army Group South would coordinate with Army Group Center to the north in re-taking Kursk. Commencing operations on February 19, von Manstein directed General Paul Hausser's SS Panzer Corps to strike south as a screening force for a larger assault by General Hermann Hoth's Fourth Panzer Army. Hoth's command and General Eberhard von Mackensen's First Panzer Army were ordered to attack into the overextended flank of the Soviet 6th and 1st Guards Armies. Meeting with success, the early days of the offensive saw German troops breakthrough and sever Soviet supply lines. On February 24, von Mackensen's men succeeded in surrounding a large part of Popov's Mobile Group. German troops also succeeded in surrounding a large portion of the Soviet 6th Army. Responding to the crisis, the Soviet high command (Stavka) began directing reinforcements to the area. Also, on February 25, Colonel General Konstantin Rokossovsky launched a major offensive with his Central Front against the junction of Army Groups South and Center. Though his men had some success on the flanks, going in the center of the advance was slow. As the fighting progressed, the southern flank was halted by the Germans while the northern flank began to overextend itself. With the Germans exerting heavy pressure on Colonel General Nikolai F. Vatutin's Southwestern Front, Stavka transferred 3th Tank Army to his command. Attacking the Germans on March 3, this force took heavy losses from enemy air attacks. In the resulting fighting, its 15th Tank Corps was encircled while its 12th Tank Corps was compelled to retreat north. The German successes early in the battle opened a large gap in the Soviet lines through which von Manstein pushed his offensive against Kharkov. By March 5, elements of Fourth Panzer Army were within 10 miles of the city. Though concerned about the approaching spring thaw, von Manstein pushed toward Kharkov. Rather than advance to the east of the city, he ordered his men to move to the west then north to encircle it. On March 8, SS Panzer Corps completed its drive north, splitting the Soviet 69th and 40th Armies before turning east the next day. In place on March 10, Hausser received orders from Hoth to take the city as soon as possible. Though von Manstein and Hoth wished him to continue the encirclement, Hausser directly attacked Kharkov from the north and west on March 11. 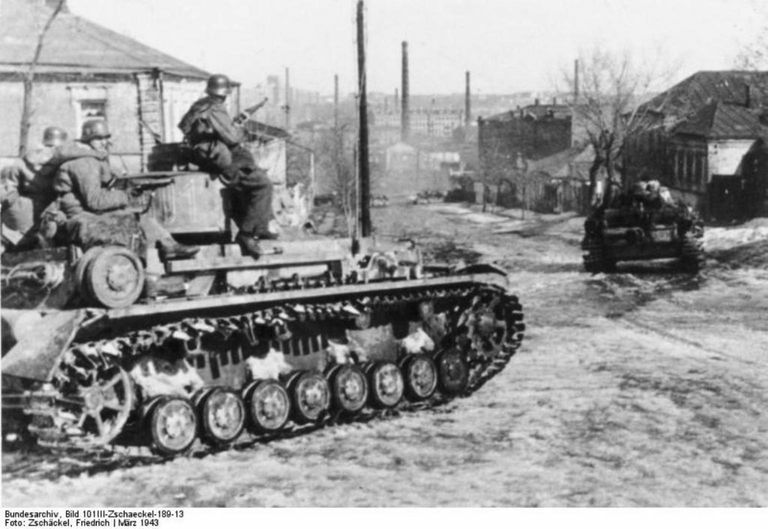 Pressing into northern Kharkov, the Leibstandarte SS Panzer Division met heavy resistance and only gained a foothold in the city with the aid of air support. The Das Reich SS Panzer Division attacked into the western side of the city the same day. Stopped by a deep anti-tank ditch, they breached it that night and pushed on to the Kharkov train station. Late that night, Hoth finally succeeded in making Hausser comply with his orders and this division disengaged and moved to blocking positions east of the city. On March 12, Leibstandarte division renewed its attack south. Over the next two days, it endured brutal urban fighting as German troops cleared the city house-by-house. By the night of March 13/14, German troops controlled two-thirds of Kharkov. Attacking again the next, they secured the remainder of the city. Though the battle largely concluded on March 14, some fighting continued on the 15th and 16th as German forces expelled Soviet defenders from a factory complex in the south. Dubbed the Donets Campaign by the Germans, the Third Battle of Kharkov saw them shatter fifty-two Soviet divisions while inflicting approximately 45,300 killed/missing and 41,200 wounded. Pushing out from the Kharkov, von Manstein's forces drove northeast and secured Belgorod on March 18. With his men exhausted and the weather turning against him, von Manstein was compelled to call a halt to offensive operations. As a result, he was unable to press on to Kursk as he had originally intended. The German victory at the Third Battle of Kharkov set the stage for the massive Battle of Kursk that summer.